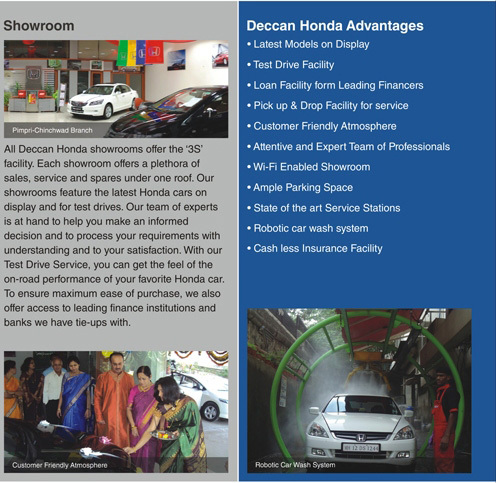 Deccan Honda on average services 150 cars per day. 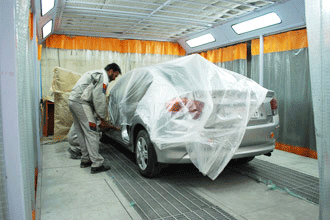 Workshops are manned by competent personnel who have been trained by HCIL to attend to repairs for the entire range of Honda cars. 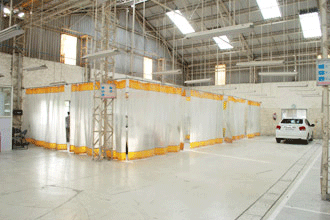 The workshops are well equipped with state of the art machinery to provide excellent after sales service. Facilities such as pickup & drop as well as 24 hour service help line are available. Our service centers are open 7 days except Pune Service center open on 2nd n 4th Sundays & Pimpri Service center on 1st and 3rd Sundays as Aurangabad Service Center open 6 days a week other than festival & national holidays"
We open at 9.00 a.m. and close at 6.00 p.m. However, for a major service and major repairs it may take couple of days or even longer and it would be wise to pick up the vehicle by 5 p.m. in order to avoid the last minute rush. Please expect to wait for at least an hour depending on what is wrong with your vehicle. If it takes longer than anticipated, the service advisor will notify you and he or she may put you in a loaner, if one is available. Vehicle Pickup – Drop facility – We have dedicated team of Service Advisor’s and drivers for Vehicle pick up drop facility. Customers have to book the slots for the facility 2 days prior. Services are available 6 days a week 10.00 a.m to 12 p.m. Parking Space – Ample of parking space, with secured premise. Driver Lounge Facility for the customer's drivers. We appreciate the fact that the customers go through tremendous amount of mental agony whenever their car meets with an accident. They often keep wondering whether the same levels of performance of their car, fit and finish etc. can get restored by the dealer. 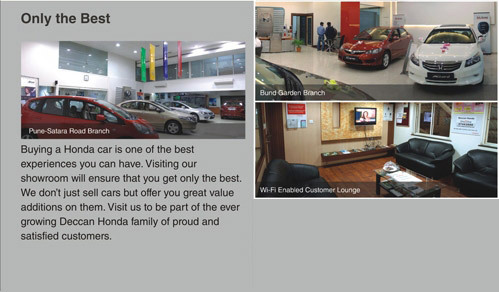 Well equipped with the following facilities to address the exact needs of customers. Preserve your Insurance policy safely. Renew your insurance before expiry date to avail of full benefit. Please remember to renew the policy in time. Procedure for renewal of lapsed policy is very complex. Verify the POLICY EXCESS information on the renewed policy immediately upon receiving the Policy. For policies taken through us we remind customers and also arrange for renewal at your door step. Keep a photocopy of the Policy in the glove box along with a copy of the RC book and your driving license. Call the insurer on the toll free number at the earliest and keep them informed orally and submit claim form. Contact the dealership for assistance to tow the vehicle if Radiator or Under-Chassis is damaged or suspected to have suffered an impact. The vehicle must have been driven by a valid driving license holder. Police report must have been obtained for major accidents and is imperative incase of third party damages. Policy should not have expired at the time of accident. Other parts would be settled after applying percentage depreciation mentioned in the Policy. Claim forms of all major Insurance companies are available in-house and processes such as Inspection, Survey of the car, Estimates etc. is taken care of by us. Assistance will be arranged for Towing your Car from the accident spot to our dealership. Our experienced staff will also be able to advise you whether to claim insurance or carry out the job at your expense. We also undertake painting of all brands of cars.